Every day, the trove of genomic data is growing. Clinics are sequencing targeted genes at high read depths to report out genetic tests. Research groups are adding new exomes and genomes to their disease specific cohorts. Agricultural breeders are genotyping their herds and flocks by the thousands of thousands. The conventional attitude to big data is give up using your existing workstations and servers and fully commit to an alternative universe of computation: clusters of computers run by complex management systems, opaque distributed file systems only accessible by specialized tools and software completely rewritten for this specific and often proprietary platform. At Golden Helix, we believe there is an alternative approach. Modern workstations and servers have powerful multi-core CPUs and plenty of RAM. Be prepared to switch from exomes to whole genomes in your clinical or research use cases. We will demonstrate the latest VarSeq version with a completely rewritten and optimized interface for analyzing whole genomes that can effortlessly work with tens of millions of variants. We will review the challenges that face clinical labs and research consortiums looking to aggregate their growing number of sequenced samples and how VSWarehouse was built with a scalable data store and tight integration with VarSeq to meet those challenges. Breeding programs need to run prediction algorithms that would seemingly be limited by the size of the matrices a single machine can operate on. We present our completely novel approach that makes it possible to analyze sample sets into the tens and hundreds of thousands available in our recent SNP & Variation Suite release. 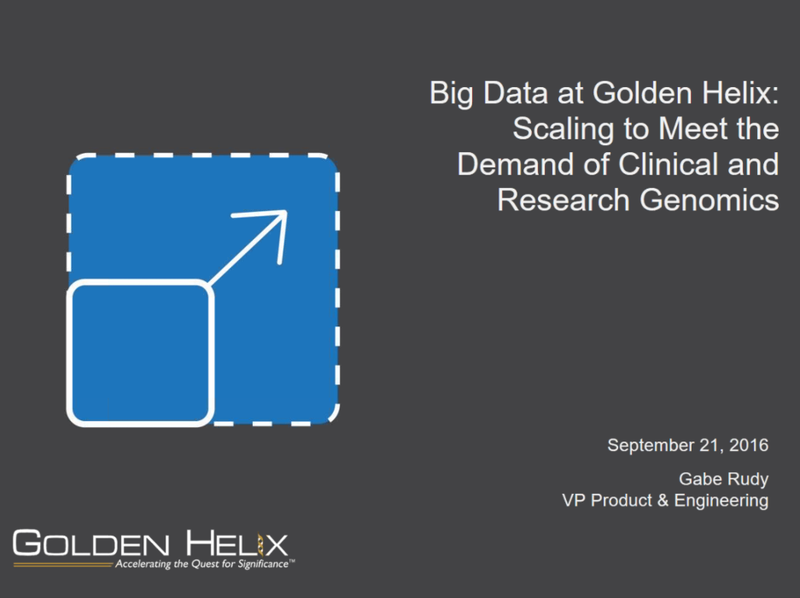 Golden Helix is constantly pushing what is possible, and this webcast will help you rethink what you can do with your own genomic data.